Your teeth affect your whole body. When they’re healthy, you’re healthier too. A missing tooth can affect your bite, speech and eating choices. As you rely more on your remaining teeth, you increase the chance they will wear out prematurely, or be damaged or lost. Now research has shown that loosing your teeth will actually shorten your lifespan. Missing nine teeth for nine years or more reduces our lifespan compared to a contemporary who maintains their teeth. The authors of the study believe that our ability to eat appropriately will help prevent small medical problems from growing into larger, life threatening, health complications. The good news is we are able to keep our own teeth healthier, longer today than ever in the past so that tooth loss is less frequent than in previous generations. Additionally, replacement of missing teeth with bridges or fixed implant crowns maintains our full dentition to ensure life long health. 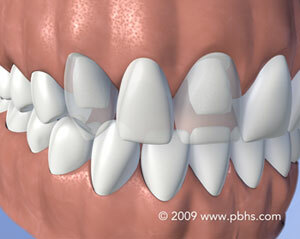 Replacement of missing teeth with partial or complete dentures unfortunately do not match that result. A follow up study showed that bite force strength is related to life span as well. A lower bite force results in a shorter life expectancy. Replacement of missing teeth with partial dentures and complete dentures results in a lower bite force than when we use bridges and implants. 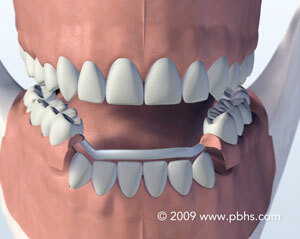 A fixed bridge is an option when you are missing one tooth or a few in a specific area. Bridges are made by placing crowns on the teeth adjacent to the missing tooth and connecting these crowns to one for the missing tooth. This bridge is cemented in place as a fixed solution to missing teeth. Bridges are good long-term solutions that research shows can last 15-30 years depending on the number of missing teeth and location in the mouth. When you are missing a single tooth and the tooth on either side is used for support, this fixed bridge is a three tooth solution for a one tooth problem. A removable partial denture is a very cost effective method of restoring multiple missing teeth. It has a metal frame that is mostly hidden from view to which teeth and pink acrylic are attached replacing the missing teeth and bone. This is one of the most effective solutions when the patient is missing multiple teeth and has lost the bone that once supported the teeth as well. But, it is removable and therefore is moveable. 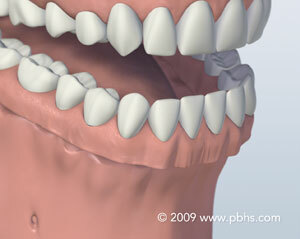 The most common solution, for people missing all teeth in one or both jaws are complete dentures. Most patients can be very comfortable with upper dentures, it is the lower that can be challenging to some. Dr. Sharifi teaches dentists all over the country on how to fabricate the most comfortable, highly functional upper and lower dentures. 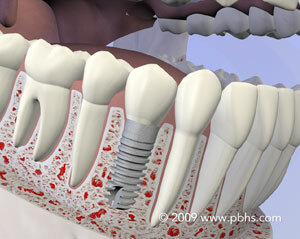 Dental implants are the tooth replacement solution most similar to natural teeth. Implants support individual replacement teeth, short-span bridges for a few missing teeth and long-span bridges for multiple missing teeth. Unlike conventional bridges, no adjacent healthy teeth are damaged when we use dental implants. Unlike natural tooth bridges, implants should last the rest of your lifetime. Implant-supported replacement teeth can be attractive, stable, and comfortable for every patient and every application. Contact our office for a consultation to address these options for your specific dental needs.